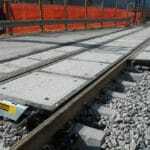 View our highly resistant Swisscross level crossing products that are easy and quick to assemble. Apart from the normal concrete rail crossing we offer innovative level crossings made from rubber, resin and a concrete-rubber mixture. Our pure rubber crossing for high duty loads, the resin slip protected crossing for pedestrian and the rubber-concrete level crossing offering the advantages of concrete and rubber material. Please view the individual products for an overview over the advantages and use cases of the products. Click here to go back to the Rail Infrastructure Product Overview. The new model Swisscross RUBE® combines the advantages of the concrete crossing with the advantages of the rubber crossing. We offer best vibration damping, noise reduction and highest durability even in frost and rain. 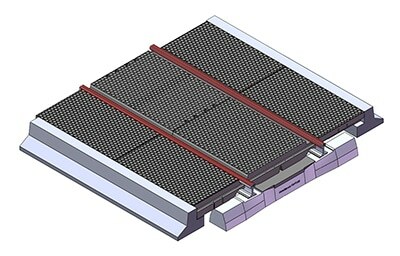 High Load resistance and less deformation at the same time. 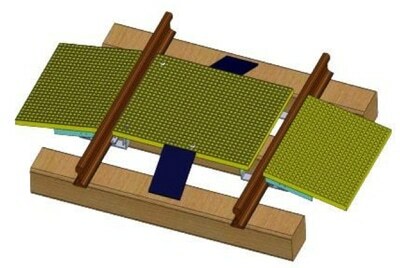 The load is distributed across 3 sleepers. Swisscross HD: the rubber level crossing for “heavy duty” rails. Offering good load resistance, vibration damping and noise reduction. Ensures complete electrical isolation between the two rails. Elements for small bending radii are available as well. 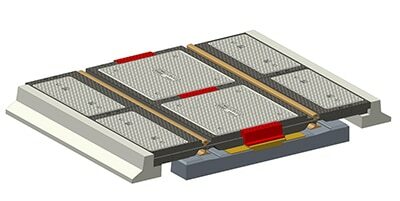 The special joint makes the mounted platform particularly solid, long-lasting and homogeneous. The resin level crossing for service and pedestrian passages. With its mesh upper surface the crossing is especially suitable for building service crossings in rail stations and escape zones for metro trains and at tunnel exits. Safe slip protection for persons crossing the rail. The crossing is very robust in corrosive environments such as frost and rain. with a maximum load of 500 or 1000 kg/m2. The resin structures are fire resistant and conform to most international regulations concerning smoke emission.